This advanced ESL lesson plan is the second of three lessons on The mind. It contains activities, games and resources for teaching English students how to express purpose, reason and result. Also, if you use an iOS or Android device, you can get offline access to these materials through the TEFL Handbook app. 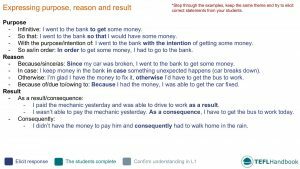 Step through and explain each grammar point, eliciting example sentences from your students and adding the best ones to the board. Students have to create phrases using the target language for the lesson. Add the following sentence prompts to the board and have the students work individually to create sentences using the phrases from the board work. Before they begin, elicit solutions to the first question and add the best one to the board. 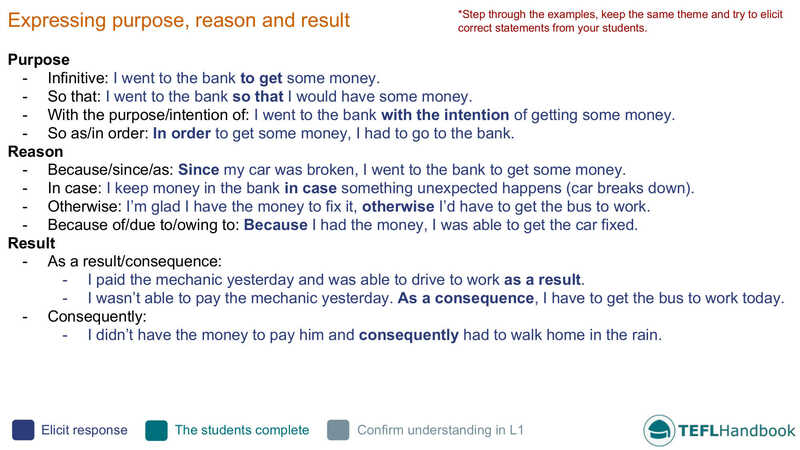 At the advanced level, students should attempt to make their sentences as interesting and complex as possible. Therefore, encourage them to test the boundaries of their understanding and ask questions when they are not sure. After they have finished, they should spend some time comparing their sentences with a partner. For smaller groups, correct the activity together, adding the best examples to the board for the other students to copy. 1. When we arrived, we found out that our flight had been cancelled due to extreme weather conditions. 4. I'll make sure I get up early tomorrow so that I can study for an hour before I go to work. 5. Since Margaret is out sick today, let's postpone today's meeting until next week. 6. As a result of overtraining on Tuesday, Mark will not be fit for today's match. Students will quiz each other on the reason, purpose and result of some recent tasks. Begin by having your students write down three things they've recently done and three places they've been. They can be as interesting or mundane as they wish. When they have finished their lists, divide the class into pairs and have the students quiz each other on each of their activities and locations. The student who is asking questions must take on the role of an (annoyingly)inquisitive child, continually pressing their partner on each answer. Given that some of these interviews can get quite ridiculous, they should treat this activity like a game, where the aim is to answer as many questions as possible without becoming repetitive or vague. Demo this with another student before they begin. Teacher: Sara, tell me something you did recently. Student: I went to a concert with my friends. Student: So that I could see my favourite band and spend some quality time with my friends. Teacher: Why do you like that band? Student: Because they have an unusual sound and the lead singer is very charismatic. For this activity, we're going to prepare students for their homework assignment. Start by writing the title of their homework assignment at the top of the board. "Is social media making us more narcissistic?" Create a table underneath with the headings yes and no. Next, have a group discussion and complete the table with as many ideas as you can. Explain to your students that they are going to write an article that argues a response to this question. They have to decide which side they want to take. Encourage them to focus on two arguments and use the following outline. Elicit as much of this as you can through group discussion. Students have to represent abstract concepts using mime while their teammates try to guess the correct answer. Start by dividing the class into two teams. On each turn, give the student in play a noun connected to the mind. That student must then act out the concept for their teammates, who earn a point when they guess it correctly. To make it more competitive, split the board into three parts, set a stopwatch for two minutes and give the performing student three words to act out. The team with the best time wins. *Since this is advanced level, only accept the noun form as the correct answer. For example, for 5, "confused" would be incorrect. We hope that you found a few of these ideas useful. Our next free lesson in this series focuses on developing conversation skills. Also, Be sure to bookmark our complete list of advanced level ESL lesson plans, as well as our entire collection of ESL courses.